Bed bugs have long been a part of our world. One theory is that they emerged in prehistoric times, living in caves with our primitive ancestors, and then followed humans into man-made structures all over the world. In our era, bed bugs became a concern about 10 years ago as tourists staying at East Coast hotels began reporting bites. Because bed bugs are efficient “hitch- hikers,” these infested travelers inadvertently carried bed bugs to other hotels as well as into their homes. Today, there are reports of bed bugs on the East and West Coasts in America, and they are becoming more prominent in the Midwest. According to 2010 research conducted by the National Pest Management Association (NPMA) and the University of Kentucky, 95 percent of pest control companies reported encountering a bed bug infestation in the prior year. By contrast, before 2000, only 25 percent of pest control companies surveyed had encountered a bed bug infestation. Recently, the rate of increase in the spread of bed bugs has slowed. This is most likely due to an increased public awareness and the development of more effective control methods. However, the battle is ongoing because many strains of bed bugs have demonstrated a resistance to pesticides. While clutter in a room can provide bed bugs with safe and cozy hiding places, the cleanliness of a site has nothing to do with acquiring an infestation. Bed bugs feed primarily on blood and emerge from hiding places, usually at night, drawn out by body heat and by the CO2 we exhale. To date, they have not been shown to transmit disease, but can bite several times in one location and leave saliva in the wounds, which can cause raised welts that resemble mosquito bites or hives. Needless to say, these bites are at least uncomfortable, and the presence of bed bugs can psychologically impact people. Bed bugs typically are found in areas where humans have spent some time sleeping. Such areas might include the seams of mattresses, in box springs, headboards and in the tiny cracks of bed frames. They may also find harborage in the upholstery of chairs and other furniture, around the edges of carpets, and in the baseboards and moldings of infested rooms. They generally seek shelter within striking distance of humans. About the size of appleseeds, adult bed bugs can fit into tiny nooks and crevices, and lay their eggs anywhere. 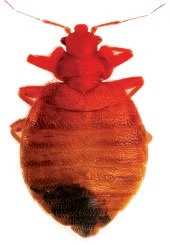 Bed bugs must consume a blood meal prior to “molting” into their next developmental stage and females require a blood meal in order to produce eggs. Bed bugs can lay dormant for extended periods of time when no host is present and studies have shown that adult bed bugs can survive for months without feeding. You can visually identify them by finding live insects, their eggs, or their molted skins. Inspections may also uncover feces, which look like tiny black dots and are typically found near their harborage. Bed bugs are good hitchhikers and can lodge themselves in clothing, luggage or any other personal possessions left on, or around their harborage. They can attach themselves to pest control professionals as well, so wearing personal protective equipment (PPE) such as a Tyvek suit along with gloves and shoe covers can be helpful when inspecting and treating for bed bugs, as well as aiding in identifying their presence on service professionals. An inspection might also involve the use of specially trained dogs to locate infestations. Individual pest control companies may own these dogs and employ their handlers or may use independent contractors. Just about any breed of dog is trainable, however smaller breeds have easier access to tight places, which might allow for a more thorough inspection. Like bomb or drug-sniffing dogs, these animals alert when they detect a specific scent. However, visual confirmation of that alert is important and should be attempted, to avoid false positives. Ideally, dog handlers also require training to work with these animals, and must be committed and willing to take the time to ensure that they are an effective and accurate team. The National Entomology Scent Detection Canine Association (NESDCA) and other groups certify these teams, however, in addition to this certification; there is a need to continually train to ensure that everyone is up to the task. There are three primary methods to eliminate bed bugs: fumigation, pesticides and heat. All of these can work in specific situations and all have limitations. For example, fumigation can work well on mattresses, clothing, luggage or other items that can be sealed in an airtight casing or container. However, for a large room or building, a fumigation can involve considerable expense and inconvenience. Regarding pesticides, the U.S. EPA has certified more than 300 chemical pesticides for use against bed bugs, and bed bugs exhibit resistance to many of them. Additionally, pesticides cannot always be applied to fabrics or upholstery to ensure the destruction of bed bug eggs. Many times there is a need for repeated follow-up treatments and inspections. Heat is an effective tool because it can kill all stages of bed bugs, including eggs; however, it also can be costly relative to pesticides, and it requires that the property owner leave the space for several hours while heat equipment is set up and the treatment is being performed. When done properly and carefully, heat can eliminate a bed bug infestation in one treatment, although follow-up inspections and touching up areas with pesticide applications are advisable. A report from Virginia Tech notes that “thermal death points”— at which bed bugs and their eggs die — depend on both temperature and duration. For example, a temperature of 113°F held for 60 to 90 minutes will kill these pests. At 118°F, the bugs will die within 20 minutes, but the eggs require 90 minutes of exposure to reach 100% mortality. Pest control professionals can heat an area to between 130°F and 140°F without damaging the structure or furnishings, and hold that temperature for a sufficient time to ensure that it equalizes and reaches all areas and/or cold spots. One particularly difficult situation we faced was a transient house consisting of a large estate home that was converted into a series of small apartments. All of the residents’ possessions were kept in bags and boxes, and stored in their rooms. This created a considerably cluttered condition in these small rooms. Our team of service professionals arranged the items in the room to allow the heat to move freely by bringing in shelving to raise the objects off the floor. They also utilized spacers, placed under furniture and other large objects, to allow the hot air to circulate beneath and allow for a more even temperature throughout. Typically, an empty room should be heated to 130°F to 140°F and held for about two hours to ensure that desired kill temperatures have been achieved. Due to the significant clutter in this structure the duration of the treatment, once target temperatures were reached, was increased. Fans were placed to circulate the heated air and the rooms were continually monitored throughout the course of the treatment. In addition, professionals actively searched for cold spots and paid attention to concrete walls and flooring that potentially created problems by allowing heat to dissipate quickly. While no solution for eliminating bed bugs is 100% foolproof, the heat treatment outlined in this situation may be the most effective method available. Heat treatments require specialized equipment, and a team of highly trained technicians to set up, monitor, and to ensure that an effective treatment has been provided. As bed bugs continue to spread and become increasingly resistant to pesticides, heat treatments can offer good results in a short time frame. Because this method can be much more successful at the outset than other methods, it may require fewer follow-ups and have you on your way to being bug free sooner. With its history of success, heat treatment is definitely worth looking into. The author, a board certified entomologist, is Bed Bug Technical Services Manager for the Reading, Pa., office of Rentokil. He may be reached at ebraun@giemedia.com.